Mellaa has this killer 45, which both sides are exquisite in my eyes, and one other boogie jam on the rare and sought after Budweiser label. 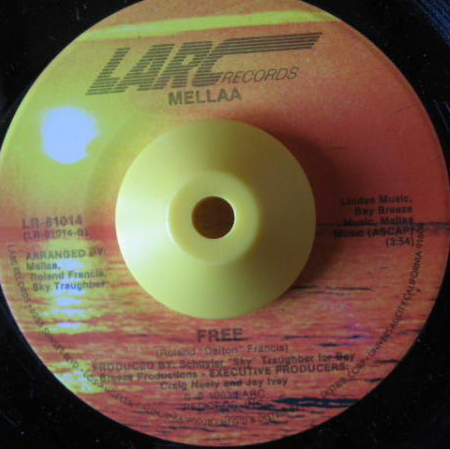 Here we have two sides of brilliant underground soul on one of my favorite labels, Larc. Part of doing this blog and uncovering these obscure artists is sometimes there's not much to share. Except the actual music itself. Just happens to be I know nothing about Mellaa. Just that this seems to fit yet another 'catagory' I learned from (again) the Japanese record cats. 'Free Soul' much like 'Modern Soul' seems to be a really loose term and can be from a range of decades. A lot of times it just fits for everything that doesn't fall into another obvious category. But, there is something uniquely 'free' about this 'Free Soul' tune other than it's obvious title. It's kinda jazzy, kinda soul, and rather strange. But, completely dope nonetheless. This tune travels around a bit jumping from thing to thing all in a carefree way. Part of enjoying it, is not knowing where exactly it will end up. All of these elements are traits of what 'Free Soul' means to me. Seems like this is a logical answer and segue from the last Odyssey post. I hope you enjoy. Mellaa was from the Bay Area, probably Oakland or Berkeley. I found their business card with the Budweiser 12" once. Agreed that this 45 is really cool. You know in all my blabbermouthin' I forgot to mention that! AND, I forgot to post the right link!! It's fixed now! ENJOY! do you still have that business card? I probably have it somewhere still, but I wouldn't know where to begin looking! I have that SAME problem! If you find it, let me know...I'd LOVE to have a Mellaa business card! Great post & sweeter than sweet song! Thanks for putting me unto "Free Soul"... I have got a lot of reading and diggin' to do now... Thanks!